Studying the physiological effects of gravity fluctuations on plants, researchers at the University of Tuebingen in Germany use BMG LABTECH’s POLARstar microplate reader in parabolic flights. It is known that light and gravity are the two most important factors in helping plants determine where top and bottom are. It is easy to eliminate light to see what effect it has on plants, but trying to investigate changes in gravity prove a little more difficult. By measuring calcium and hydrogen peroxide in plant cells with the durable POLARstar microplate reader, researchers show the effects of gravity on plants during consecutive parabolic flights. During a parabolic flight, different stages of gravitation are obtained ranging from hypergravity (about 1.8g) to microgravity (about 10-3g). In one flight, 31 consecutive parabolas are flown. Novespace, a company from France has been performing these flights for over ten years. The gravitational effects of the parabolic flight can be seen in a simulated video and in a real video. Normal gravity is designated as 1g and on the ascent of the parabola the gravity goes to about 1.8g (80% higher than normal). Then on the descent of the parabola when the experiments are performed, the period of microgravity lasts for about 22 seconds. To investigate the signaling pathway from the stimulus (no gravity) to the response (e.g. activation or deactivation of the expression of certain genes) the level of two important second messengers, Ca2+ and hydrogen peroxide, were monitored. Two transgenic cell lines derived from Arabidopsis thaliana expressing either Cameleon (a calcium sensor) or HyPer (an H2O2 sensor) were used as well as a wild type. The calcium and hydrogen peroxide measurements were performed on a fixed POLARstar OPTIMA in kinetic mode during the whole time of the parabolic flight. Results show that the calcium levels increased with microgravity and decreased afterwards, signifying an effect on calcium flux due to changes in gravity. Further parabolic flights with the POLARstar OPTIMA and with a new PHERAstar FS are in preparation. Some of the results can be found online (http://www.bmglabtech.com/customer-focus/parabolic-flights.cfm). Corresponding experiments were also recently performed at higher gravity levels with the robust POLARstar microplate reader. Using the Hyper-g centrifuge at ZARM (The Center of Applied Space Technology and Microgravity) in Bremen Germany, the entire unit has been routinely centrifuged up to 10g, further demonstrating the robustness of the instrumentation. 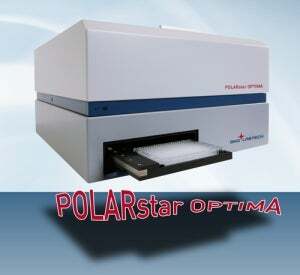 The POLARstar microplate reader from BMG LABTECH is a multimode plate reader that can measure fluorescence, luminescence, absorbance, and fluorescence polarization. Its robust steel housing and perfectly engineered machinery allow it to perform even under extreme conditions such as high and low levels of gravity. These experiments were financed by a grant from the Deutsches Zentrum für Luft- und Raumfahrt (DLR; 50WB0723).